After four years of publishing Christmas book lists, it's getting harder and harder to keep the list to just 24 books! This year, I tried to include only my very, very favorite books that strike at the true meaning of Christmas...books with a lot of heart in them and books that speak to the heart of a child. I hope you enjoy these stories as much as we do! 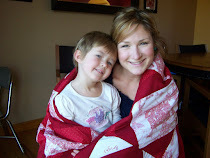 They are truly the best of the best and worthy of a good snuggled with you and your children! Merry Christmas! Ha! I'm in the process of writing a post about some of our favorite Christmas books too! Who Is Coming to Our House is a favorite with my nursery kids at church. My favorite is Mortimer's Christmas Manger. Have you read that one?